This software is new generation image software meant for Metallurgist's to do analysis in the simplest way. This is single screen window based system. The system is flexible, independent to adopt any capture card, camera or Microscope. This software can handle monochrome (8 bits) and color (24 bits) images. 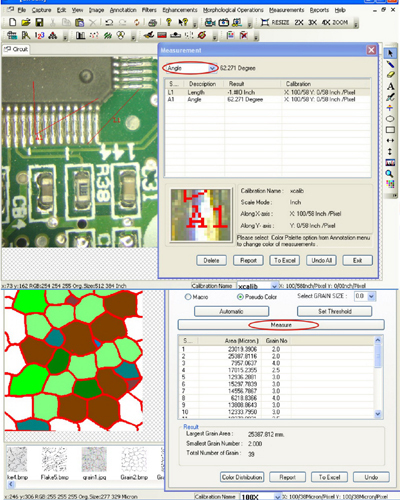 Multiple images of any size can be opened and displayed on the screen for analysis or comparison. The software supports most common formats such BMP, JPEG, TIFF, PNG, GIF & PSD. The live image can be observed and captured on the same platform. Since the system is made in Windows environment, graphs and charts displayed on the monitor can be quickly transferred to any other Windows based program like MS word, MS Excel or any other commercial Windows based software for use in reports and presentation.